I’m not a joiner and as much as I’ve enjoyed reading people’s One Word posts, I didn’t plan on participating. The One Word project is a challenge to choose a word that resonates with the core of your being, a word to focus on throughout the year that may shape your world. Three words have actually already done that for me in the past few years – balance, community, and gratitude. They’re weaved into the fabric of my being and have certainly changed how I see things. Just as I was about to set this project aside, the word that has been whispering to me for awhile became clear. I want to look for the place where my story intersects with others; I want to hear your stories; I want to make space for the great and challenging and hard parts of my own story; I want to better understand Aidan’s wordless story; I’d like to stretch my writing to tell some more people’s stories; I want to learn from and value others through story. The beauty of choosing the word story is that there will certainly be room to be powerful, brave, fearless, peaceful, joyful, wise, grateful, adventurous and so much more. What about you…what word would you choose? Interesting and cool idea. Your word is a bold choice and I admire it. I choose Faith as my one word. Cliche though it may be, it is what I need and am relying on more than anything else right now. Faith in myself that I am making the best decisions for Tess, faith in the doctors who are all part of our team now, faith in humanity that when people see Tess or any person with any type of disabilities, that they see the person first, not the disability. Faith in God that He will give me the strength and courage I need to keep going everyday, faith that my other two girls know in their hearts that I love and am here for them just as much as I am for their medically fragile little sister no matter what else is going on, and lastly, faith that every thing happens for the ultimate good even if I don’t know what that good is right now. So yeah…faith. So glad that I dropped by your blog today (visiting from One Word)… And I do love the word story… I wish you peace on your journey. I keep wanting to choose big bold brave words too, but the word that keeps coming back each time I think about this idea of having “one word” for the year is Gentle. I think I need to learn gentleness with myself, to gentle my expectations of other people and the world in general. God is very gentle with us and I want to begin to weave that into the ways I am with myself and the people I touch. Love you my friend. Story is a great word and I can’t wait to see how this plays out for you this year!! I’m trying to think of one word which communicates “in need of a savior.” Not “saved,” though I am, because I want to push the ongoing nature. What a wonderful word…story! I love words in general, but when we can write out those words to specifically identify who we are…well, that’s what it becomes OUR STORY! I’m looking forward to reading how your story is incorporating brave, fearless, peaceful! My word for 2013 is Surrender. It seemed a bit daunting at first, but just in these two weeks as He has worked in me I am learning that Surrender = Joy because in the end thanksgiving is what it is all about…this word Surrender! 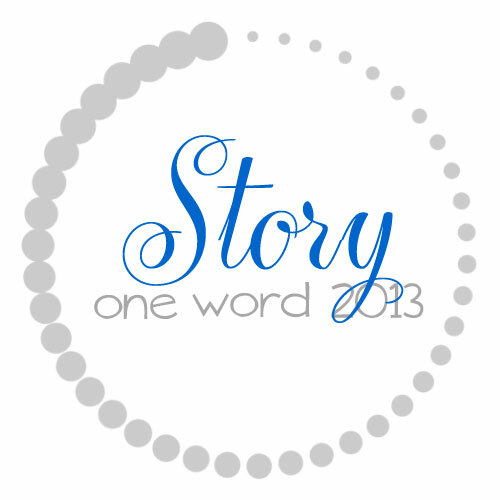 I love the word story…and all the ways it intersects. Praying for you and the unfolding of it this year. Stopping by from Melanie’s OneWord link up. Story…that’s powerful and you could end up hearing lots of interesting stories. Story is powerful…I know that most people who share their stories with me touch me in a great way. Yes! Absolutely love this!! I am so right there with you! In fact, I’m about to take an e-course about this very thing! Unashamed « After the Ecstasy, the Laundry . . .